Evening primrose has very high levels of the essential fatty acid gamma-linolenic acid, or GLA. This omega-6 oil contains up to 15% GLA and 70% linolenic acid, which your body turns into GLA. The body eventually converts GLA into prostaglandins, which are hormonesnecessary for a number of important functions. Primrose oil has many uses, but one of the prime one is for skin conditions. It is used to help alleviate itchiness caused by dermatitis and eczema, where it has proven to be an effective treatment option. In one study that included over 1,200 patients, evening primrose oil was remarkably good at relieving many of their symptoms, such as itching, redness. Women often use the oil to help with breast pains caused by PMS. 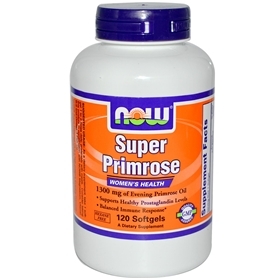 Super Primrose has been observed concerning heart health. Studies have shown that using evening primrose oil on a daily basis can help lower a person’s cholesterol, blood pressure, and safeguard one against coronary artery disease and thus decrease the chance of heart disease and heart attacks. It is also known to have anti-inflammatory properties, and might help ease the symptoms of rheumatoid arthritis and chest discomfort. Another major way primrose is used is to alleviate distress that is commonly associated with menstrual symptoms. Many women worldwide are finding relief from the beneficial GLAs found in primrose oil. Suggested Usage: As a dietary supplement, take 1 softgel 1 to 2 times daily, preferably with meals. Consider taking this product in combination with NOW® Magnesium, Vitamin B-6 and Omega-3 Fish Oil.